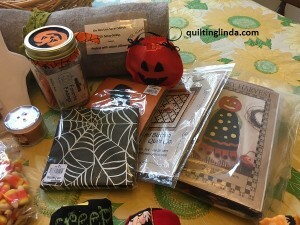 I won a basket of Halloween quilting goodies! 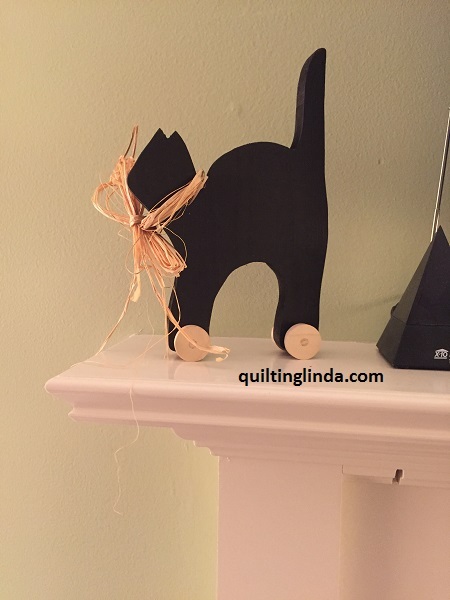 I am a member of the the Common Threads Ohio Quilt Guild in Columbus and we had a quilt show yesterday. The show featured quilts from Common Threads Guild members. It was fabulous, so many beautiful and well made quilts! 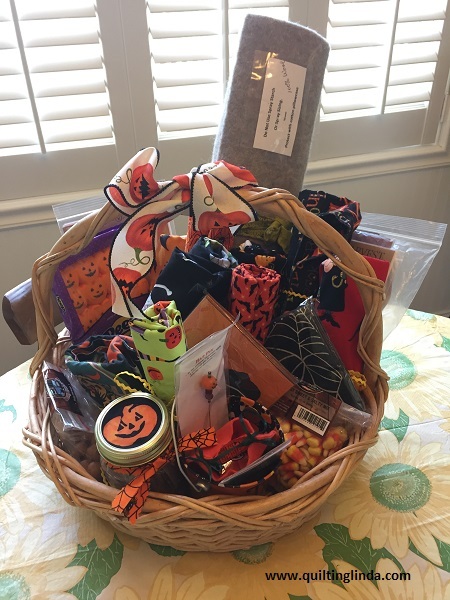 In addition to a display of all the wonderful quilts, we raffled a quilt and several fantastic baskets of quilting items. There was one more basket (bucket) of non quilty items such as duct tape, flashlights, etc., called a man bucket. I bought six tickets and put two of them in the bowl for the Halloween basket. It had a wool pressing mat that caught my eye. I have been wanting one ever since I saw them mentioned in some blogs I follow. Imagine my delight and surprise when my number was called for that basket! 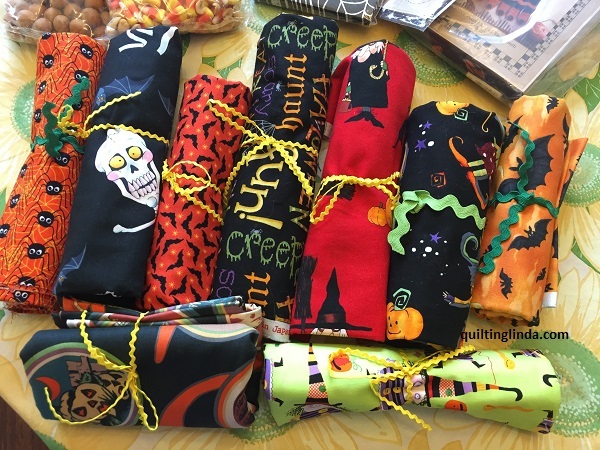 I have been working on a mystery Halloween quilt and the final clue was published today. Now I will have to make another Halloween quilt to use all of these wonderful fabrics. 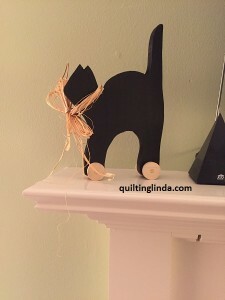 What fun and a good excuse to make another quilt. There are so many yummy candies in the basket. I will have to share them with the grandchildren. There are two packs of holiday napkins, a pattern and a kit with a pattern. 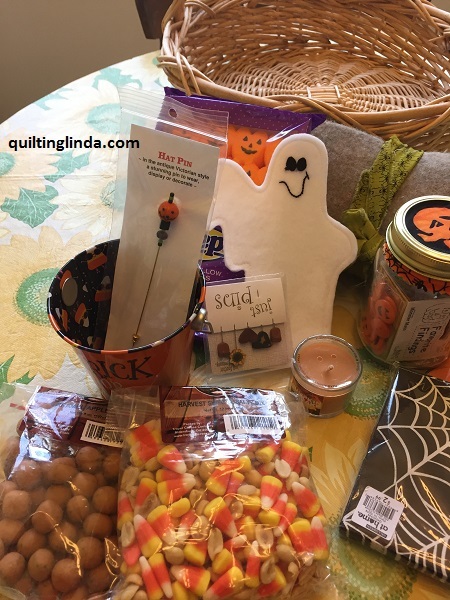 The jar is full of Halloween buttons and embellishments and there is also a candle called pumpkin cupcake. This was so much fun to open and examine each item. There are even more items that I haven’t mentioned. Thank you to the person who put this basket together for the guild raffle. I will enjoy it for a long time. P.S. I forgot to include a picture of the cat the was in the basket.